We are beyond excited to announce another giveaway! This one is courtesy of SKINN Dimitri James. It's positively amazing and has a retail value of $145! 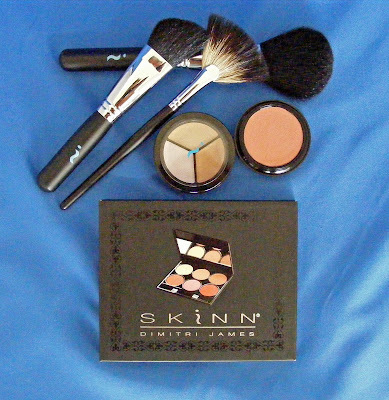 All in one Highlight, Contour, Bronze & Blush 6 Color Compact with brushes. Color Touch Eye, Cheek and Lip Glow. Wet Lips Super Shine Gloss. The first three products are the ones shown in the picture. ack! que chevere! I entered 15 Min. Beauty's contest for this and totally lost [super bummer]. I've been wanting to try the "sculpting with a fan brush" thing! ...hank hoffman has totally effed me up, ya'll. Good Luck then! How are the lippies doing?